I can’t believe it’s already the end of July! Where is the time going? It’s been really stormy here the last two weeks, and stormy weather is my favorite kind of knitting weather. Watching the lightning from the safety of my couch as thunder tears through the sky… *sigh* it’s beautiful. Even the toddler seems to handle the storms pretty well. She is pretty fearless after all. Anyway, I wanted to show you some of the things I’ve been working on this month through all the heat and storms. Remember last post when I freaked out about bracelets? Yeah, I made a few. Just a few. 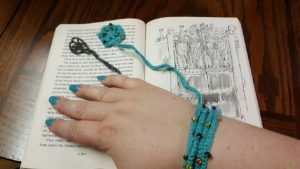 Here’s an easy wrap bracelet, and these are the bookmark bracelets. I also worked on a Dumpling Kitty. And last, but not least, I started a tiny bunny.